Naupaka is a ubiquitous native shrub along Hawai’i coastlines that in the Northwestern Hawaii Islands will form dense stands in places. In other places, there are less dense or pockets of naupaka with small clearings. It has large, rubbery bright green leaves and white berries. Naupaka seed leafs are ovate, fleshy, and have a prominent tooth that is usually light green or yellow at the apex. The seed leafs lack veins, which do not become obvious until the plant reaches a moderate size. 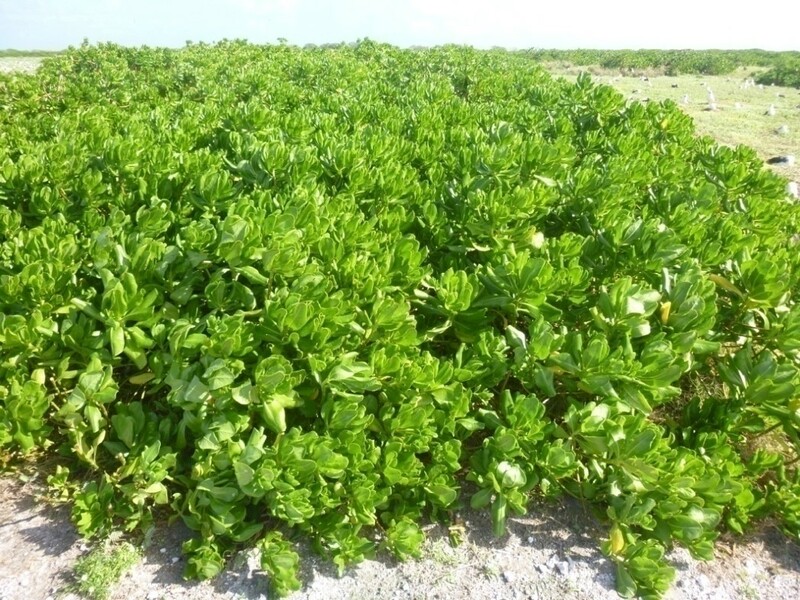 Naupaka is an important dune-creating shrub that stabilizes the sand and has been outplanted on Kure since 2002. Naupaka’s greatest attribute is that it builds the dune structures by sending out hair-like roots into sand that is blown or washed into the plant. It is responsible for the formation and retention of one of the highest and most extensive dune structures in the Northwestern Hawaiian Islands with some of the dunes reaching 20’ high. The buried branches generate extensive fine root structures that capture the sand. The exposed top leaves of the naupaka continue to grow and the process continues until a dune is formed. The direct outplanting of naupaka in some of the blown-out areas along the dunes began stabilizing sand in a matter of one year and completely filled in a 40-foot diameter area in less than 5 years.